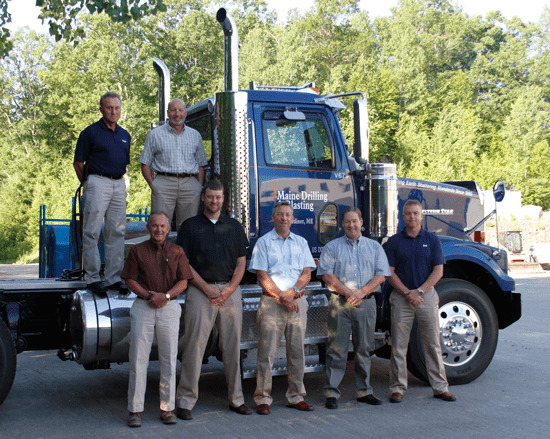 Maine Drilling & Blasting has earned our reputation as one of the safest, most experienced rock blasting and drilling companies in the Northeast and Mid-Atlantic areas. During the past 50+ years, we’ve performed over two million controlled blasts for highways, site development, quarries, houses lots, utilities and marine work. We’ve drilled some of the most aesthetic presplit faces, helped plan and develop over 180 quarries, installed rock anchors over water, under stadium seating and 50 feet above highways, and mechanically broken hundreds of thousands of cubic yards of rock with our hoe rams. We have extensive experience in projects from wind farms to ski-slope development. In 2001, we established an Engineering Department, which has since enabled our blasters and drillers to rely on the most advanced topographical information, computerized simulations, laser profiling of rock faces, and bore-tracking. Fully staffed, this Department also provides project and customer support in the form of defining scopes, volume surveys and value-added engineering. Among drilling and blasting companies, Maine Drilling & Blasting is known for its world class maintenance on drills. Our Equipment Service Group provides industry-leading service, knowledge, and technology to our fleet of drills and hoe rams, and their operators. Our equipment is state-of-the-art and maintained with precision. Driven by safety-consciousness and the demands of being a good neighbor, Maine Drilling & Blasting has increased its investments in state-of-the-art safety technologies, public relations programs and community outreach. Key technical managers on staff train in-house personnel, as well as educate front line responders, local officials, our customers and the general public. My name is Chase Goodrich from the Goodrich Family Farm in Salisbury. When I was asked to write a review and Letter of recommendation for Maine Drilling and Blasting, I was more than happy to do so based on the extraordinary service Pat and his crew provided us. To give a short backdrop, my sister and I, joined my Father and Grandfather as the 3rd generation to farm our family farm. As the farm has transitioned from generation to generation we have seen our farm grow, shift and adapt, all to meet the common goal, which is to provide an opportunity to raise our families on the farm, and provide the next generation that same opportunity, through sustainable dairy farming. Currently, we milk our herds out of two milking facilities located about a mile apart. As my sister and I move the farm into the future, our vision is to build a barn at the Home site to house all our milking animals for a few reasons; to consolidate the one milking facility, as well as make manure collection centralized for all the dairy cows, in order to fulfill a renewable energy project, creating natural gas out of cow manure and food waste. It had been a long process to finally get our project to a place where we could start construction on the barn. We were ready to begin putting our vision to life, and we could not have been more excited. When we first started clearing the land, and looking at what we had to work with, we were immediately struck with two concerns. The first being, it was going to take a substantial amount of fill to bring the barn site up to grade. The second major concern was two large runs of ledge running near the north end of the barn, not in the footprint but we were concerned they would cause inconveniences to operation flow. Blasting those ledges became an option we had not planned upon. Upon an initial site visit, it was clear to our family that Pat showed the knowledge and dedication to his craft. He was easily able to ease our concerns. Working with Pat, it was clear he understood our vision for the project, the financial constraints of the project, and all the other needs of our farm to make the project work. He came up with an excellent plan for blasting that set us at ease, and finally, the wheels were really beginning to move on our barn. My Dad has built a few barns, but my sister and I are very green to the process. Pat made things go as smoothly as I could have hoped for. A great plan on paper is a wonderful thing in theory, but it is truly only great if it can be executed. The crew that oversaw the daily blasting on the farm (Cody, Mark, Krystal, Brit, and Steve), were lights out in executing the plan. They were fast and efficient and got the job done well. They worked in perfect harmony with the other crews we had there to help execute the blasting. The daily farm operation is fast pace, with lots of moving parts; the crew was always understanding to any of our hardships and never got in the way or caused a stress on our operation. Fantastic. And finally, we were left with a fantastic product that created a wonderful base for our new barn. The project came in under our budget and went better than we could have hoped for. We couldn't be more excited to continue on with construction. They always say a good roof always starts with a good base and the crew at Maine Drilling & Blasting really set the standard and got us off to a fantastic start from the ground up on the new barn. Kudos to Pat and the rest of the crew at Maine Drilling & Blasting!"